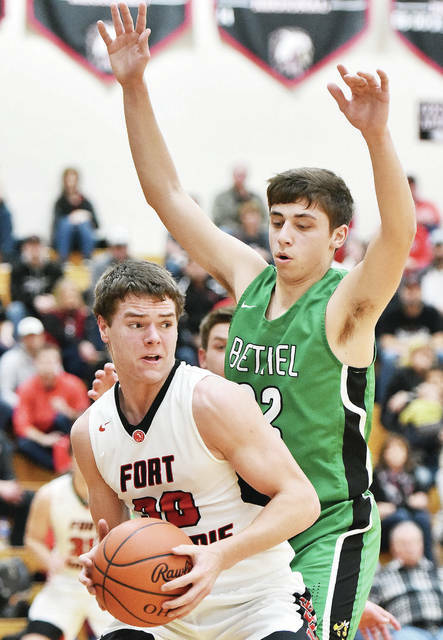 Fort Loramie’s Nate Meyer shoots as Bethel’s Tompson Bean defends at during a nonconference game on Tuesday in Fort Loramie. Fort Loramie's Grant Albers looks to get around Bethel's Ethan Rimkus during a nonconference game on Tuesday in Fort Loramie. Fort Loramie's Nolan Berning, left, passes to Nathan Ratermann during a nonconference game on Tuesday in Fort Loramie. 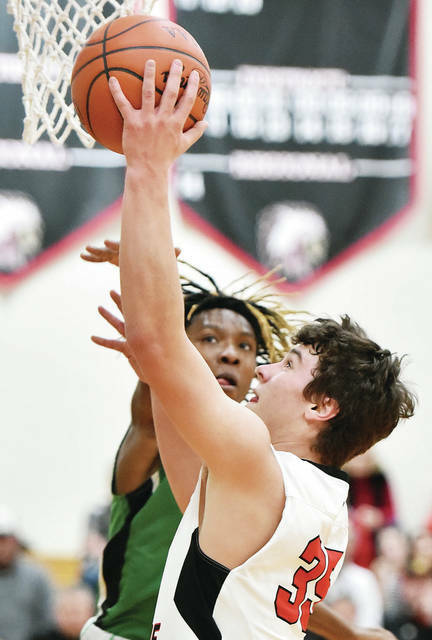 Fort Loramie's Nathan Ratermann shoots as Bethel's Kendal James defends during a nonconference game on Tuesday in Fort Loramie. Fort Loramie’s Grant Albers moves the ball away from Bethel’s Ethan Rimkus during a nonconference game on Tuesday in Fort Loramie. 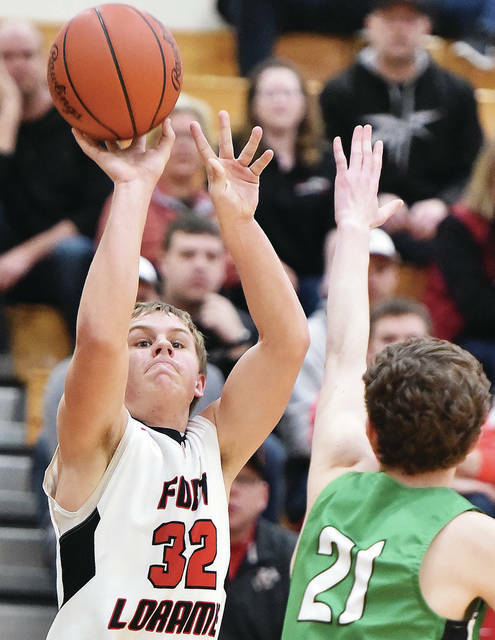 FORT LORAMIE — Fort Loramie took control early and cruised to a home nonconference win over Bethel on Tuesday. The Redskins scored the first eight points and took a 14-5 lead by the end of the first quarter. They used a 16-6 scoring advantage in the second to push the lead to 19 at halftime. 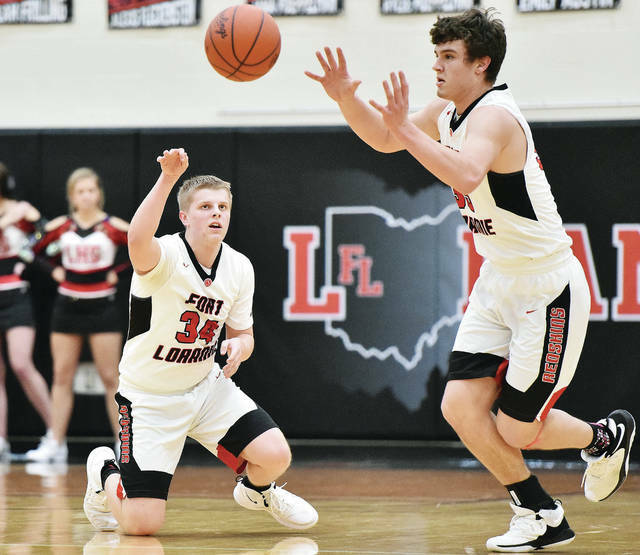 Eli Rosengarten and Nathan Raterman each scored eight points for Fort Loramie. Eight other players scored. After taking a 16-15 lead by the end of the first quarter of a nonconference game on Tuesday in Versailles, Butler put Versailles away in the second with a 17-4 scoring advantage. Evan Hiestand led Versailles with 14 points. Ryan Martin scored 11 points and Kody Naftzger added 10. A halftime pep talk was at least part of what sparked Versailles to a nonconference win over Arcanum on Tuesday night. The Tigers were leading 17-12 at the break, but had several first-half turnovers that led veteran coach Jacki Stonebraker to talk about scoring the basketball more than anything else with her team during the halftime break. The pep talk worked as Versailles opened the third quarter with an 8-0 run to put a little more distance between them and the young, scrappy Trojans. Senior post player Elizabeth Ording started the 8-0 run almost immediately when she scored at the 7:47 mark. Arcanum’s following trip down the floor was short-lived as junior guard Caitlin McEldowney stole the ball near mid court and took it in for a layup at 7:21. A little less than a minute later, junior Lindsey Winner hit a jumper and then after another Arcanum turnover, Versailles senior Kelsey Custenborder scored and just like that — in a span of less than two minutes — Versailles’ lead grew to from five to 13 points at 25-12. To make matters worse for the Trojans, Versailles did the same thing in opening the fourth quarter with an 8-0 run that expanded its lead from 10 to 18 points at 40-22 with 4:48 left to play. Junior Brooke Stonebraker was the catalyst in that run scoring six of the eight points, including two from the free-throw line. Hannah Barga also connected on a pair of free throws during that run. Ording and Custenborder were the top scorers for Versailles with 10 points apiece. Winner had nine and Stonebraker contributed seven from the post. 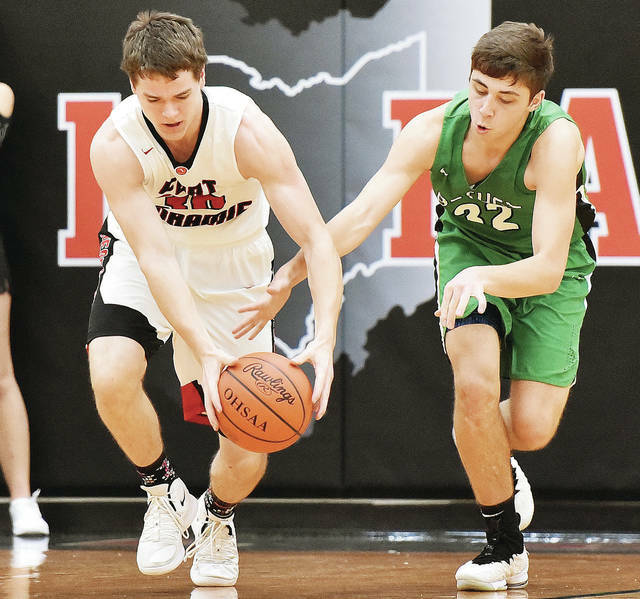 Sidney stayed close to Stebbins in the first half but couldn’t keep up in the second of a Greater Western Ohio Conference crossover game on Tuesday. Stebbins had a 26-17 lead at halftime and used a 18-5 scoring advantage in the third to put the game away. Lehman Catholic rallied in the fourth quarter but Anna held on to win on Tuesday in Sidney in nonconference action. It was tied 6-6 at the end of the first quarter but Anna used an 11-5 scoring advantage in the second and a 12-5 advance in the third to build a 29-16 lead heading into the final quarter. Lehman cut the final gap with a 13-6 advance in the fourth. Grace Monnin had 10 points and five rebounds for Lehman, while Anna Cianciolo scored seven points. Lauren McFarland added six points and Rylie McIver had four steals. Anna statistics were not reported. New Bremen couldn’t complete a rally attempt in a home nonconference game on Tuesday. Spencerville took a 12-4 lead by the end of the first and led 22-19 at halftime. The Bearcats built a 35-28 lead by the end of the third. The Cardinals outscored Spencerville 16-13 in the fourth. Kelly Naylor led New Bremen with 19 points. Sidney’s boys and girls bowling teams split a match with Piqua on Tuesday at Bel-Mar Lanes. The boys beat Piqua 2,398-2,186 to improve to11-5 overall and 8-5 in Greater Western Ohio Conference American North Division play. Kaden Abbott had a 516 series and a 299 game. Jaxon Rickey had a 427 series and Drake Cromes had a single game of a 231. The girls lost to Piqua 1,511-1,505 to drop to 4-12 and 3-10. Emma Hurley had a 323 series, Camryn Smith had a 295 series and Sarah Bell had a 271 series. Fort Loramie’s Grant Albers looks to get around Bethel’s Ethan Rimkus during a nonconference game on Tuesday in Fort Loramie. Fort Loramie’s Nolan Berning, left, passes to Nathan Ratermann during a nonconference game on Tuesday in Fort Loramie. Fort Loramie’s Nathan Ratermann shoots as Bethel’s Kendal James defends during a nonconference game on Tuesday in Fort Loramie.